The Kirkaldy brothers were Scottish professional golfers and much of their exploits in Ireland are courtesy of Andrew Kirkaldy’s biopic, Fifty Years of Golf: My Memories, probably one of the more underrated books in the golfers library despite one that is most likely to induce a few chuckles. Hugh was the younger brother who won the Open Championship in 1891 from his brother Andrew and lived from 1865 – 1895 which is probably an important fact to bear in mind. Andrew lived from 1860 – 1934 and wrote his memoirs in 1921, which is a jolly jaunt through early golf in Scotland using in rye humour and for the most part his mother tongue (at least phonetically) to express his ideas and recount his many tales. However his tales are not without some Irish reminiscing whether of playing in the country or playing with said countrymen. 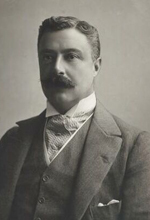 Another connection between Andrew Kirkaldy and Ireland was that before being appointed professional at St. Andrews he was the private professional to Lord Dudley who would later become the Lord Lieutenant of Ireland (Viceroy, Viceregal or King’s Deputy) between 11 August 1902 and 4 December 1905. Open competition for amateurs and professionals, medal play, 36 holes-1st prize, won by Andrew Kirkaldy, 1st round 78 strokes, 2nd round 76 strokes. The first prize was £30 and the second prize was £20, which was won by my brother Hugh. As we had agreed to halve whatever we might win, this meant that each got £25. We had a desperate race in a jaunting Irish car for the boat, nearly slipping off the side seats all the way. Hugh said to me on board, ” £5 from you, Andra.” I was handing it to him when a gust of wind blew the fiver into the channel. What I said need not be written. A sailor offered to jump overboard and try to recover the note if we would get the captain to stop the boat and reward him with a pound whatever happened. I did not think the chance was good enough, and Hugh agreed to let me off by paying him £2 10s. So we each took home the half of £45. Dollymount was the course for the Royal Dublin Golf Club since the late 1880s and Kirkaldy’s story refers to a championship which took place on 8 September 1894 over the Dollymount links. If this was to be considered a “major” championship it would pre-date the championship in Portrush that is often considered the first Irish Professional Championship. The field for the Portrush was a much stronger field than the Dollymount event even at the time, as neither Vardon or Herd were Open Champions but the prize-money on offer was comparable and while Dollymount was open to Amateurs and Professionals all those playing in Portrush were “Professionals”. The Kirkaldys both played at the Royal Portrush Tournament between Thursday 12 – 14 September 1895 as well, Harry Vardon saw both Andrew and Hugh off in the first and second rounds respectively only to lose to Sandy Herd in the final. At the time I’m speaking about, Lord Dudley was Lord-Lieutenant of Ireland, and he very often had me to play with him. I suppose it was quite right to call him ” His Excellency,” though I am not much up in such things. He wired to me from London, saying he was coming to St. Andrews, and asking me to give him some games. I was only too pleased, for Lord Dudley was a grand master. The policeman said, ” I’ll watch that,” or something of the sort. Anyway he did not go over to Lord Dudley, and I marched away with his lordship’s clubs on my shoulder as an unlicensed caddie, telling him nothing about what the policeman said. A week later I got a summons to appear at the court, charged with carrying clubs for hire without a licence. Never in my life did I feel more affronted. Fancy a professional golfer being disgraced in that way. I tell you it went against the grain to obey that summons. But what else could I do? I could not run away and have judgment against me for not turning up. The court was crowded as if it had been a murder trial, instead of only being a test case about caddying. When the Fiscal read out the charge, the Bailie-that is the presiding magistrate-looked over at me as I sat there scowling in the dock, and he says, ” Andrew, what have you to say to this charge? Are you guilty or not guilty? The caddie-master then came into the witness-box and swore that I carried clubs on such and such a date for hire without the badge that caddies were now required to wear. He also told the court that I had been properly warned and that I committed the offence with my eyes wide open. Just as if I would carry clubs with my eyes shut. ” No, no, no,” said one of the three or four magistrates on the Bench. ” I suppose so,” says he. ” I did not,” said the caddie-master. ” I did not,” says the caddie-master. ” Then what’s this case all about,” says I, sitting down in a fine temper. ” Did ye think so? ” said I. ” I just gaed to the point by the shortest cut,” said I. ” Good day,” says I. ” I’m muckle obleeged to you. Did you never try caddyin’ for the good of your health? As Lord Lieutenant of Ireland residence was the Viceregal Lodge or better known now as Áras an Uachtaráin, the home of the President of Ireland. So the next of Kirkaldy’s stories about Vardon outside Áras an Uachtaráin in 1903 trying to remember the password for entry into the palatial mansion in Phoenix Park is ever so strange when you consider that professionals weren’t allowed enter the golf clubhouses. Once I saw Vardon looking rather glum. It was when we and several others were playing at Dollymount, Dublin, and were the guests of Lord Dudley, at the Viceregal Lodge. The sentry always stopped us at the gates. I came up one day and found Vardon waiting there. ” What’s the matter, Harry? ” I asked. I gave it to him and we passed through. Vardon looked very relieved. I think he was afraid of being obliged to stop out all night. The battle of Tel-El-Kebir took place in 1882 and even at this time a large part of the British Army were made up of Irish soldiers. At Tel-el-Kebir, in the Egyptian Campaign-my first and only taste of the soldier’s real business – I was twice shot in the leg and once speared in the arm. I could roll up my sleeve and show you the mark. It was an ugly cut, but it might have been worse. An Irishman, named Teddy O’Neal, saved my life by making short work of the big Arab that fell as his spear was coming for my chest. Teddy gave him the ” daft yin,” as we say in St. Andrews, meaning the knock-out blow. Given that the likes of Lord Dudley, Willie Fernie, Arnaud Massey and Kirkaldy were making this journey its reasonably safe to say Kirkaldy is referring to the Lord Lieutenant’s Golf Party in 1903 and it wouldn’t be too much of a stretch to say all the aforementioned were also staying at the Viceregal Lodge. ‘ You don’t take the tiller any more,” said Massy. ” I will take charge. You are a mad Irishman.” Our reason for crossing this stretch of water was to take a short cut to Portmarnock golf course. We did not try that short cut again. Andrew Kirkaldy’s unwavering belief that the stance is the cornerstone of a great golfer. Some professionals were in argument about the Stance outside a club-house in Ireland some years ago, and a number of gentlemen listened to the argument. Of course I was in it and placed the Stance before everything. In the end one of the professionals bet me half a sovereign that I could not prove my theory. We went on the lawn and several of the amateurs formed themselves into a jury. I placed my challenger’s feet one on a level and one on a little raised bank, and asked him to show me how he could swing. It was an extreme example, but it proved my point in a way. Then I asked him to stand and swing in his own style. He made a fine drive, for his Stance was exactly what I had been saying it should be. Then I shifted his feet an inch or two and asked him to drive. His shot was partly pulled and partly smothered. The jury gave me the verdict and the half-sovereign. It is the same for all shots. Pains taken with the Stance are well spent. A stiff left arm for the iron and a firm grip, all will be well if the Stance is right. In putting, stand straight to the hole; don’t cut any capers. A good honest, business-like Stance is all that is necessary.